Above, the Weather Channel’s Kait Parker did an investigation of anti-wind activists in Ohio. Below, update on how anti-winders have succeeded in degrading the credit rating of at least one county. This is a tale of two Ohio counties. While Van Wert County ended all wind energy development last year, Paulding, located to its north, embraced it. The results are that Paulding County taxpayers are benefiting from increased county tax revenue, stronger public schools and a boost in its bond rating to Aa3 from A1 by the international agency Moody’s Investor Service. What’s the Significance of a Higher Bond Rating? The $700 million in wind development since 2013 has been a financial windfall for Paulding, generating $2.47 million in tax revenue last year from three existing wind farms, according to Zielke. The new Northwest Ohio Wind Farm that came online in 2018 providing electricity to all of General Motor’s Ohio and Indiana manufacturing plants, and two other wind farms that have been approved, are expected to add $2.5 million or more annually in tax income.That totals nearly $5 million per year in wind tax revenue. A major beneficiary of the income is Wayne Trace High School in Haviland, Ohio with nearly $1 million of new funding because of the turbines. It’s not that Van Wert County, stuck with a lower Moody’s rating of A1, has no wind development. The 152-turbine Blue Creek Wind Farm spreads across the border of the two counties with 115 in Van Wert County. Blue Creek generates more than $2 million in tax revenue for Van Wert County — a greater amount than any other development project. But last year, Van Wert County decided to go no further. C&BP will examine the role played by this anonymous group in part two of this series. But first, we called the economic development directors of other northwest Ohio counties to talk about the developments in Paulding County. We were unable to reach Hardin County’s Jon Cross, but we did get through to several others. Adams was referring to the anonymous, last-minute insertion of language into a 2014 Ohio state budget bill that mandated wind turbines be set at a minimum distance of 1,125 feet from adjacent property. The minimum distance had previously been 550 feet. Embattled House Majority Floor Leader Bill Seitz — then an Ohio State Senator — was the only lawmaker to speak in favor of the huge setback during less than 10 minutes of discussion on the Ohio Senate floor. He has repeatedly justified and defended the setback provision, despite being a self-avowed “free-market conservative” that should not be picking energy winners and losers. Emails uncovered by Checks and Balances Project between Seitz and influential lobbyist Sam Randazzo – known as “the Randazzler” – supplied Seitz with eight critiques of a budget amendment that Seitz used to support his efforts to block changes to the setback rule in 2017 that would benefit wind development. Recently, a committee of the Ohio Public Utilities Commission (PUCO) sent the names of four individuals to Governor Mike DeWine to fill a soon to be vacant seat. Then, on February 4, 2019 PUCO Chairman Asim Haque resigned his top position effective March 1. Hours later, Gov. 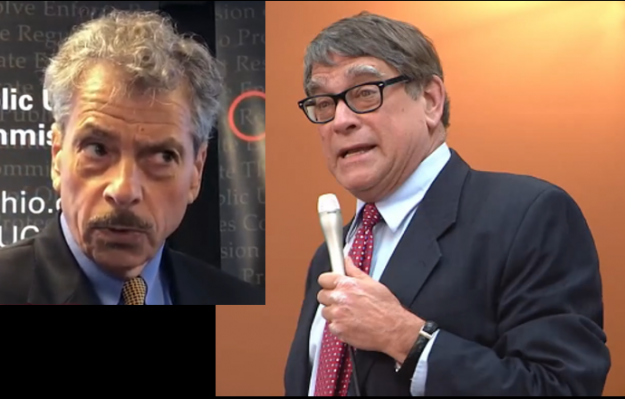 DeWine chose Randazzo to chair the powerful Commission. Meanwhile, as anti-winders seek to destroy income opportunities for hard pressed farmers, the Trump administration’s tariff policies turn up the suffering in farm country. We need Jeremy Kitzen, anti-wind guy, to get some tougher questioning. What’s his party? Does he deny climate science (as in any part of it?) Is anyone paying him for his anti-windbaggery? He needs to have a psychological profile done to figure out why he’s really so against wind. I’m not sure how something can be quieter than an AC at 300 feet but still even audible at 1200 feet. Can you hear an AC at 1000 feet? If the turbines are >1200 ft. from anyone else’s property, can the windbagger even hear them without sneaking onto the owner’s property to be annoyed? Those gorgeous turbines are certainly less annoying than his astoundingly ugly sign, which is just begging to be marinated in some refined fossil fuel and then roasted over an open fire. If people come out to the country for quiet, don’t they also come for quiet views? Are they really OK with THIS guy determining the aesthetics of their home and views? Ah, but you’re neglecting the sound of whining that accompanies wind turbines, which may not be very loud, but is exceptionally annoying. Yes! Whenever I can I try to forget the whining, like the high pitch of air allowed to very slowly escape from a balloon. Like the alleged health problems, it only happens when there’s an active anti-wind campaign in the area, funded by, of course, the usual bunch of fossil fuel corporations–Koch, Exxon, ALEC, Republicans and the rest. A few hundred feet from the Bowling Green, Ohio, municipal turbines, they sound like a dishwasher running in the next room. Traffic moving by on US 6 is louder — and further away.